The Berchtesgadener Land Dairy, founded in 1927 as a dairy cooperative with 54 participating farmers, now comprises more than 1800 member farms. The dairy was already processing organic milk in the early seventies and had developed strong partnerships with organic associations, DEMETER and later also Naturland. In 1976, the Berchtesgadener Land Dairy merged with the Chiemgau Dairy to form the Milchwerke Berchtesgadener Land Chiemgau eG headquartered in Piding, Germany. On a daily basis, the 280 employees at this ultra-modern dairy process 600,000 liters of milk into familiar and popular dairy products. The company generated a turnover of over 167 million euros in 2008. 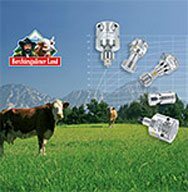 The ecological principles of the Berchtesgadener Land Dairy are closely linked with the safe and careful refinement of its milk products. This requires the highest standards in technology and hygiene. Anderson-Negele, a longstanding partner, has made a valuable contribution in the field of process sensors to help the company meet these standards. All devices that come into contact with the final product must be carefully cleaned to eliminate bacterial contamination. CIP systems (CleaningIn-Place) clean modules that come into contact with the process, such as tanks, piping and sensors, without it being necessary to dismantle the system parts, thus ensuring a high availability of the entire production plant. In the food industry, the CIP system is therefore an essential, permanent component necessary for maintaining quality standards and meeting hygienic regulations during production. The automation of the CIP process requires reliable sensors that meet the stringent requirements for chemical resistance and withstand rapid and frequent temperature fluctuations, thus ensuring a reliable process flow. The CIP system of the Milchwerke Berchtesgadener Land Chiemgau eG was entirely rebuilt in 2007 and now consists of 10 cleaning circuits for the raw milk area, the production plant and the tanks. An additional five circuits are used to clean the milk tankers. During cleaning agent separation, the various agents flowing back out of the system are differentiated and feed into the correct reservoirs (base, acid, rinse water). A highly cost-effective method of separating the phases is by means of conductivity and turbidity.While acids and bases can easily be differentiated from rinse water or the product by means of their conductivity, turbidity measurement is the most exact and reproducible identification method of the phase transition between milk products and water. 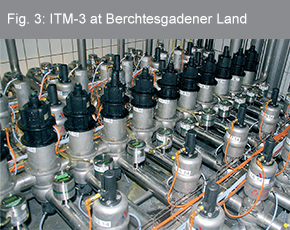 In the Berchtesgadener Land Dairy, the so-called “rinse milk separation” is performed using the ITM turbidity meter from Anderson-Negele. When starting up, running empty or transferring between tanks, the milk product must be differentiated from the rinse water remaining in the piping. Even small variations in the product concentration due to larger or smaller portions of water in the liquid result in a considerable fluctuation in the measured turbidity.The turbidity sensors, which must be installed directly upstream of the changeover valve, switch precisely when the preset product concentration is reached. Depending on the switch point, the downstream valves are set to either direct the milk-water mixture into the rinse milk tank or to the drain.Accuracy and reliability are the foundation for an optimal and low-loss phase separation. Compared to a manual or time-controlled changeover, wastewater costs are minimized since the rinse milk is only discarded when it reaches a predefined concentration. 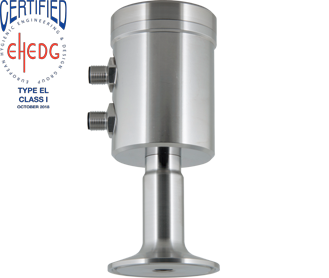 Turbidity measurement can also be used if the medium is to be separated into the individual CIP cleaning phases on the basis of solid matter in the liquid due to undissolved contamination. In this application, the ITM turbidity sensor monitors the rinsing process online and continuously measures contamination in the rinse water.Depending on the turbidity value, the rinse water is directed either into storage tanks for reuse or to the drainage system for disposal.Cleaning agent recovery can save several thousand liters of water in each rinsing operation and considerably reduces waste water costs. These facts, as well as Anderson-Negele’s experience as sensor specialists for hygienic applications for over 30 years, explain the time-honored and successful business relationship between the Milchwerke Berchtesgadener Land Chiemgau eG and Negele Messtechnik GmbH.We would like to thank the Milchwerke Berchtesgadener Land Chiemgau eG for their confidence in our company and look forward to working together in the future. An infrared diode irradiates infrared light into the media. Particles in the media reflecting the irradiated light which is detected by the receiver diode (backscatter principle). The electronics calculates the relative turbidity of the media according to the received signal. The relative turbidity is based on the Anderson-Negele calibration standard and is displayed in “%TU”.